As I plan my Paris adventure with my besties, I want to make sure that on this trip I try out some iconic food stops along the way. Since my last trip back in 2009, I have read so many brilliant 'best places to eat' in Paris from travel bloggers to brands recommending something different for everyone. Given the fact that I am only there for three days, I have decided to create a list of my top three iconic food spots in Paris. This gorgeous Parisian tea rooms and patisserie is famous for their indulgent hot chocolates and a place that I have been excited to visit since seeing my bestie IntheFrows post on 24 hours in Paris last year. When I think of Paris, one of the first thing that springs is their sweet smells and indulgent cafes filled with intricate cakes and rich hot drinks. The great thing about the Angelina is that they are located through Paris, including a boutique near Musée du Louvre. Les Ombres restaurant is a place that I read about in a Time Out article a few years back now. This place is absolutely stunning - located on the top floor of Musée du Quai Branly, here you'll find 360 views of the Eiffel Tower. Their menu serves a fixed price lunch for people more on a budget or you can opt for cocktails on the terrace (avg. 13 euros) before dining in their restaurant. 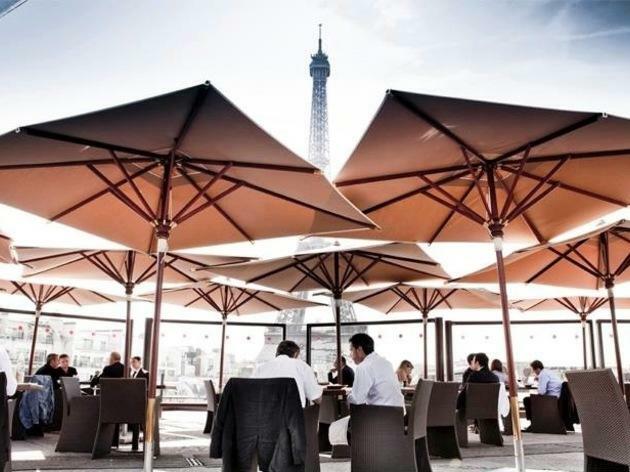 From a tasty breakfast to dinner and cocktails, Chez Francis is located right on the Champs-Élysées and also over looks the Eiffel Tower. I actually came across this place via Instagram explore section and it looked so relaxed and fun. The person had tagged seafood that they were about to tuck into - it looked pretty awesome! If you have any must-eat or cool places to dine at in Paris, then please send me a tweet @eattravellove.